The more traditional Yule Logs are brownish, rough and bumpy, and, well, log-like. But that doesn't mean they're all like this. The French may not be able to get past the same four kinds of sandwiches, but when it comes to the Bûche de Noël, they're getting all kinds of creative. At this point, the cakes come in pretty much any color or flavor, even a very un-Christmassy, non-traditional mango/passion fruit (the orange one at the back of this photo). I'm sure that there was no passion fruit on the menu when the tradition started, in the early, mid, or late 19th century. Which is it? Nobody's quite sure. Some credit the cakes to a Parisian pastry chef in the Latin Quarter, near Saint Germain-des-Prés, around 1834. Others think it's an invention from Lyon around 1860. Another theory gives the honors to Pierre Lacam, the personal pastry chef to Charles III of Monaco, in 1898. But what is clear is that these cakes are a "modern" take on a much more ancient tradition, dating back to at least the 12th century: the huge logs that used to be burned at Christmas time as a way to attract good luck for the coming year. Huge logs would be found, cut, and brought home, then anointed with oils, salt, honey, and wine (all or some, depending on the region) with great ceremony and prayers. Depending on the families, either the young girls of the house, or sometimes the mother, would have the privilege of lighting the log with rituals and prayers. According to some traditions, they would try to find a log big enough to burn from Christmas Eve through the New Year. In other areas, superstition dictated that the log had to burn out in three days to avoid bad luck. Sometimes the log was cut from a fruit tree to "ensure" a good harvest of that fruit. All very scientific. Needless to say, this huge Yule Log thing got harder in the 19th century, as homes started to modernize and shrink and no longer had hearths big enough for a 12-day burning log (or small children, for that matter). Today, the dessert version, which fits much better into homes, is served throughout France, in many French-speaking or historically French-linked countries (including French Canada, Belgium, French Switzerland, and also, supposedly, Lebanon and Vietnam), and in our house. 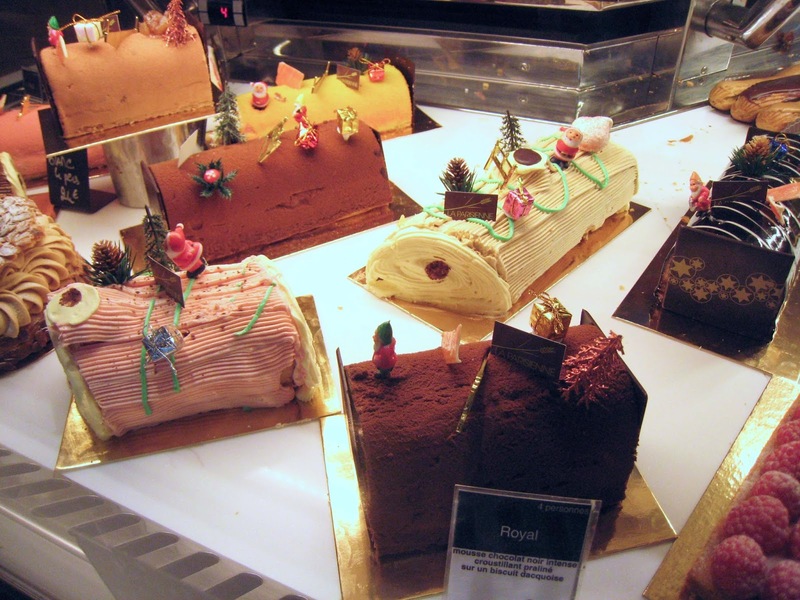 What will we do when we're back in the US and can't lay our hands easily on a Bûche de Noël? Will I have to make it myself? Now that seems like some bad luck I might like to avoid by lighting a large log on fire. Bûche Fermier, or in this case more specifically, a Bûche Cendré Fermier is a classic staple of French cheese: a raw goats' milk farmhouse log made anywhere there are goats, basically. Some famous cheese, such as Sainte-Maure-de-Touraine, are simply glorified, named, fancier, "official" versions of this cheese. That doesn't mean the humble farmhouse log is anything less than spectacular, however. The Bûche Fermier is coated (ha! I just accidentally typed "goated", how à propos) with a thin crust, wrinkled with toad-skin or geotricum mold. It can also be ashed, like a Sainte-Maure-de-Touraine and blackened to any degree. It's not hard to see why I'd choose a bûche to talk about a bûche. Both logs are intrinsic parts of the French culture -- traditions that go back so many centuries, it's impossible to pinpoint their origins. Both the Bûche Fermier and the Bûche de Noël are delicious logs that will, I am quite certain, not last in your home as long as the three days to one week that ye olde Yule Logs would burn.